Juliette has spent her entire life ostracized because she possesses a dangerous power, and now she is imprisoned. For the past 264 days, she's lived in solitary confinement, held captive by a faceless enemy. Then one day, she receives a cell mate—Adam. Juliette remembers Adam from her childhood as the only one who never mistreated her, but isn't sure if he remembers her. His appearance changes everything for Juliette, and she slowly begins to see herself as a person, not a weapon to be used. Adam offers Juliette a way out…that is, if she can bring herself to trust him. 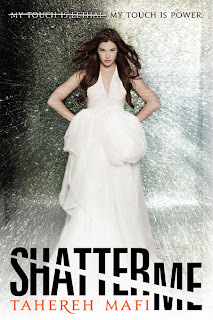 Shatter Me is a tense, surprising book that absolutely rocks. Mafi allows you to really get inside of Juliette's head with the stream of consciousness narrative, which is very revealing and fascinating to read. You really understand Juliette's pain and struggles in how she trains herself to think that she somehow is deserving of her cruel treatment because of deadly mistakes in the past, and that because of her frightening ability, she doesn't deserve humanity. Her views are shattered when Adam appears and he and Juliette struggle to trust each other; once they do, their relationship is intense and their romance smoldering. Mafi skillfully builds suspense throughout the book as the world Juliette lives in is revealed to be dark and destructive, with secrets and danger in every nook, and as Juliette struggles to stay out of the grasp of Warner, a smart, calculating young man with too much power and a dangerous fixation on Juliette. However, the central conflict throughout Shatter Me is really Juliette's struggle with her ability and touch, how it has shaped her, what it means for her enemies, and for any possible future she might have. As the drama unfolds, Juliette learns that she may be capable of more than she ever could have imagined. Despite all of the fear, confusions, and danger in the uncertain ending, there is hope for a strong new heroine who is just beginning to come into power. Fans of Shatter Me will have a hard time waiting for a sequel. Cover Comments: Even though the white dress doesn't really appear in the novel, I like how bright and eye-catching it is, especially against the silver back drop and the "shattering" effect in the background! So awesome! I am also in love with the way the title is slashed through! This one will be out on November 15th, 2011! For a chance to win Shatter Me all this month, check out the Monthly Commenter Contest! I've heard so many great reviews on this book. I don't think I've even came across a "meh" review. I'm excited to see a strong female MC-- a great book to pass down to my cousin. Can't wait to read this one! I first saw this book in an IMM video by Kristi from The Story Siren. Since then, I've read many reviews of it, but this is the first time I'm reading a description of it as "tense". It sounds better each time I read a review of this book. :) Can't wait for the bookstores here to start selling it. Shatter Day on Facebook back on the 22nd got me pretty addicted to this book - even though I was already super anxious to read it - cannot wait for its release. I keep hearing good things about Shatter Me. The publisher's facebook group was doing some cool stuff the past couple weeks, too. Can't wait to read it!